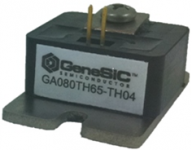 GeneSiC Semiconductor is developing an advanced silicon-carbide (SiC)-based semiconductor called an anode-switched thyristor. This low-cost, compact SiC semiconductor conducts higher levels of electrical energy with better precision than traditional silicon semiconductors. This efficiency will enable a dramatic reduction in the size, weight, and volume of the power converters and the electronic devices they are used in. GeneSiC is developing its SiC-based semiconductor for utility-scale power converters. Traditional silicon semiconductors can't process the high voltages that utility-scale power distribution requires, and they must be stacked in complicated circuits that require bulky insulation and cooling hardware. GeneSiC's semiconductors are well suited for high-power applications like large-scale renewable wind and solar energy installations. If successful, GeneSiC would enable integration of large-scale wind and solar power plants into the smart grid, the advanced electrical infrastructure that will replace today's outdated electrical grid. This project could help increase the use of renewable energy sources and in turn reduce the harmful emissions created by traditional coal-fired power plants. Projects like this could help establish U.S. businesses as technical leaders in the electronics industry and bring lower power bills to consumers.